It was the same for me, this Sunday. After my short break in Mumbai, I landed in Bangalore to sunny skies and an overflowing inbox. My proofs of the new novel were waiting for me. And that's what I did yesterday. Worked. I have also enrolled for an art course online (they are based in the US) , and I was quite excited to start that one. So soon, I will have sketches to show you. 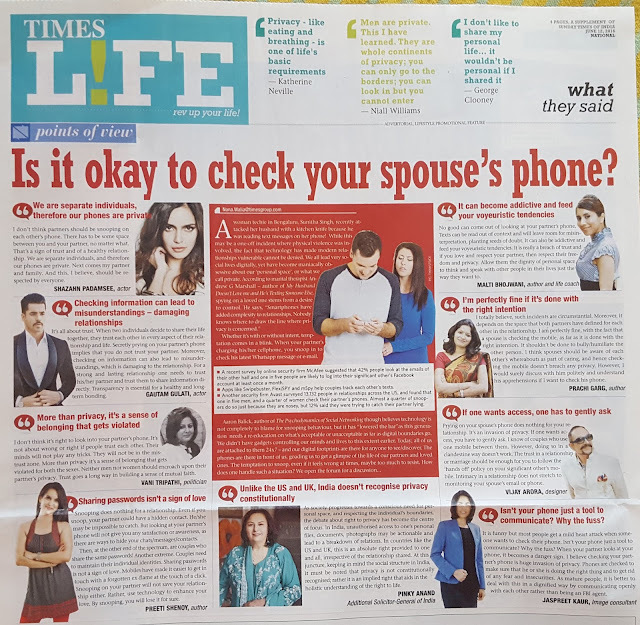 The other thing that happened today---I was on the front page of the Times of India's Times Life. It was about whether it is okay to share passwords and check your spouse's or partner's phone.Here's what I said. Today, a friend (who also writes) and I were talking about communicating. Many a time, when we communicate, we write or express what we feel. But the way it is interpreted by the other person could be completely different from what you meant. This is precisely why when an email or a text between two people,is read by another, there can be misunderstandings. Even between two people, when you writeor say something, the other person may read between the lines. Or may take into account your body language, or bring into it, the baggage from the past. The words then taken on a shade never intended. If that has ever happened, the best thing to do is apologise immediately and unconditionally, if the relationship matters to you. Ina relationship, there should never be room for ego. If you allow an egoto come in, soon it will turn into a squatter, and then become a permanent occupant, and you will not be able to get rid of that monster, who will ultimately gobble up the relationship. Till tomorrow, stay focused, spend time with your loved ones, read, relax, rejuvenate. hello mam,i am regular blooger of yours.every fan says that i am big fan of yours but not in my case. you are my mentor in indirect way of my life. in front of all your readers i say BIG THANK U fr SAVING my life as well as give PURPOSE of my life by YOUR BLOGS and YOUR ALL NOVELS. 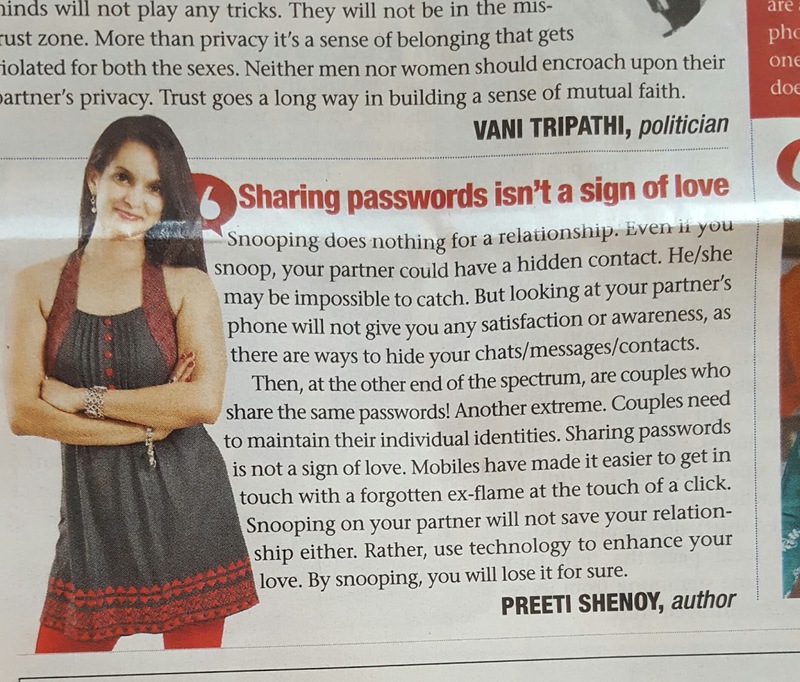 "Sharing password is not big thing.in every relationship sharing password with trust dnt fr snooping purpose. Sharing bank password will help in worst time in dead of another partner for living"
agn thank u mam fr writing and fr changing all life. Ego is of course one of the main reason in corroding a relationship. Relationships have to be reviewed and renewed. If any things seems to be going wrong through a review matters have to be sorted out before they get out of hand. Relationships also need a renewal. Surprising one's partner in a different way or doing something different for the partner. Completely agree with you mam... If you value the relationship more than you do to your ego, then there should be no problem for you to apologise even if you're not on the wrong side. And the other thing I do feel about is when you love someone truly, then forgiving that person for silly mistake should not be a big deal how extreme the mistake might be. You can always resolve issues later. Woow..!!! Straight to the point..!!! Very well said..